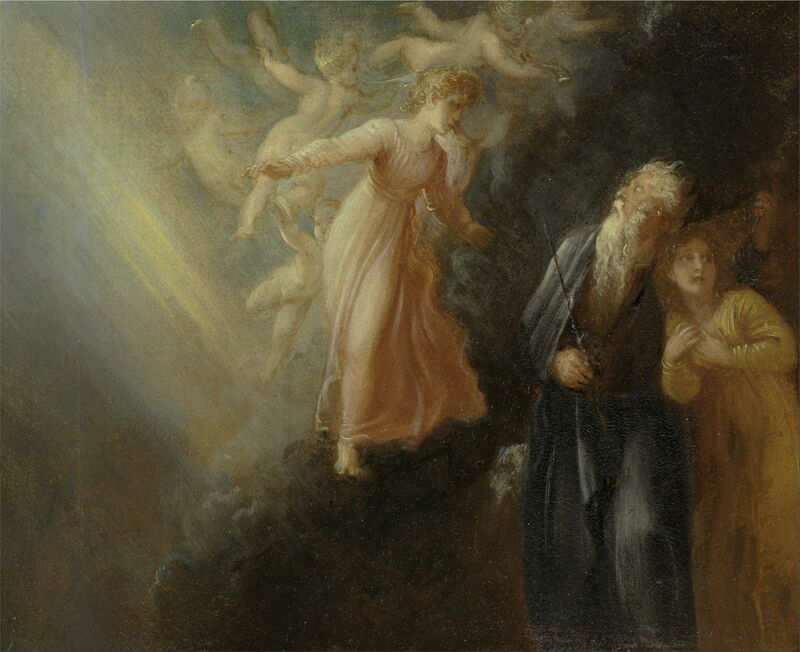 Thomas Stothard (1755-1834), Prospero, Miranda and Ariel, from "The Tempest," Act I, scene ii (c 1799), oil on paper laid on canvas, 21 x 26 cm, Yale Center for British Art, New Haven, CT. Wikimedia Commons. 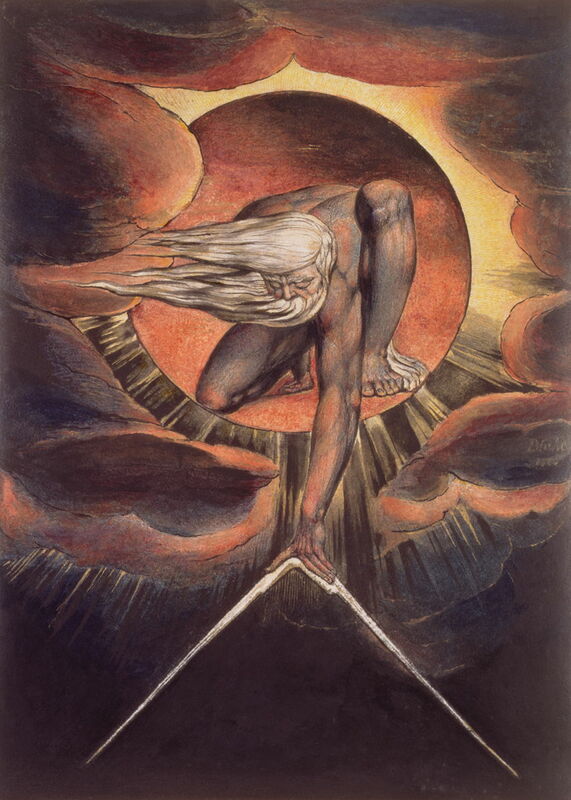 William Blake’s unique vision and genius still required inspiration, role models, and peers. This article gives a brief overview of some of the contemporary artists who are believed to have been of greatest influence over his work. By far the most obvious influence, both as a teacher and later a friend, is that of Henry Fuseli (1741–1825), some of whose paintings I have featured in this article. John Hamilton Mortimer (1740-1779), Death on a Pale Horse (c 1775), pen and black ink and gray ink on moderately thick, moderately textured, cream wove paper, 62.5 x 47 cm, Yale Center for British Art, New Haven, CT. Wikimedia Commons. John Hamilton Mortimer (1740-1779) was just a year older than Fuseli, but died when still young in the same year that Blake completed his apprenticeship as an engraver. 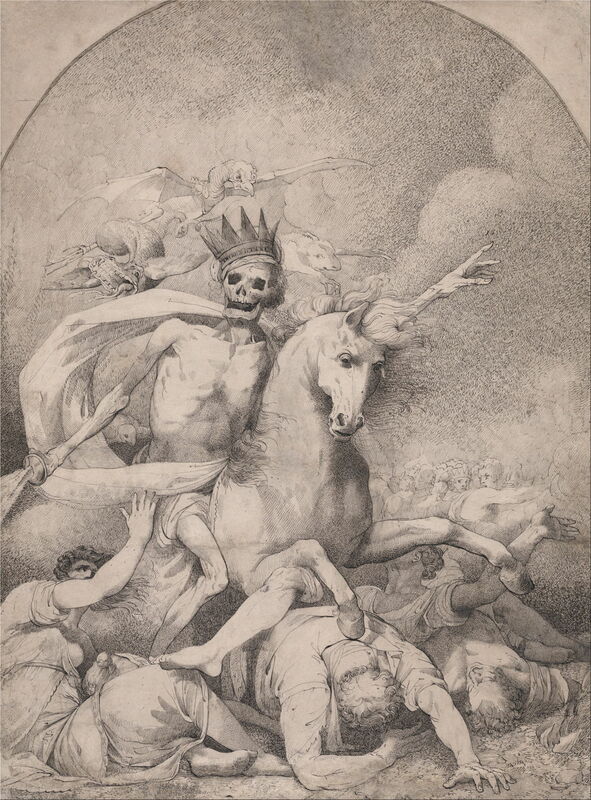 Mortimer’s Death on a Pale Horse (c 1775) was an obvious inspiration for Blake’s painting of the same name. Mortimer was at his best as a history painter, but very few of his works seem to be accessible any more. James Barry (1741–1806) was of a similar age to Fuseli and Mortimer, and rather more of his works have survived to show their influence on Blake. Barry looked set for an even more distinguished career than Fuseli, and was appointed Professor of Painting at the Royal Academy in London in 1782. He hoped to build interest in history painting in the Academy, but none was forthcoming. In 1777, Barry offered to paint extensive histories for the Great Room of what is now the Royal Society of Arts in London at the cost of only his canvas, paint, and models. He produced six paintings, for which he was paid a total of 250 guineas over a period of seven years, which bankrupted him. He became increasingly bitter about the Royal Academy under Sir Joshua Reynolds, and in 1799 published a critical letter. As a result he was expelled from the Academy – the only full academician to be expelled until 2004. 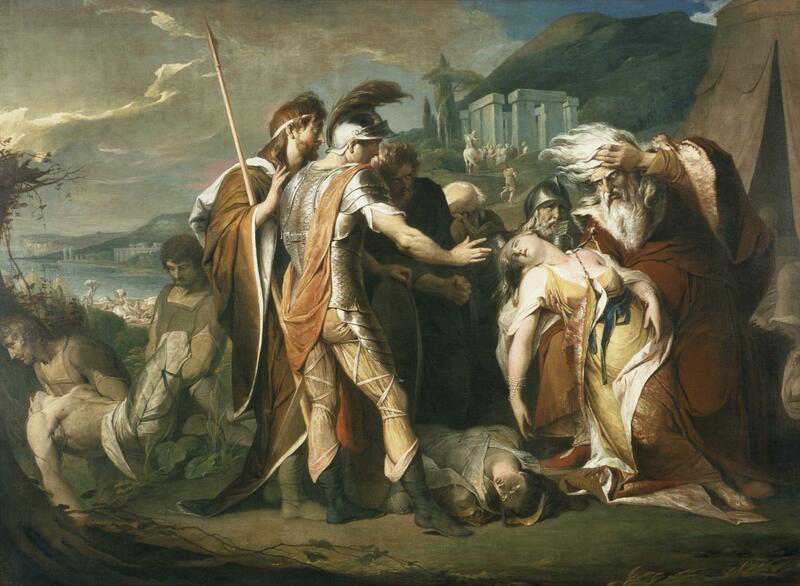 Unlike most paintings of Shakespearean subjects, Barry’s King Lear Weeping over the Dead Body of Cordelia (1786–8) did not show an indoor stage scene, but attempted to recreate the playwright’s vision of what he tried to portray on the stage. The figure of Lear is almost certainly a model for Blake’s Urizen in The Ancient of Days, below. 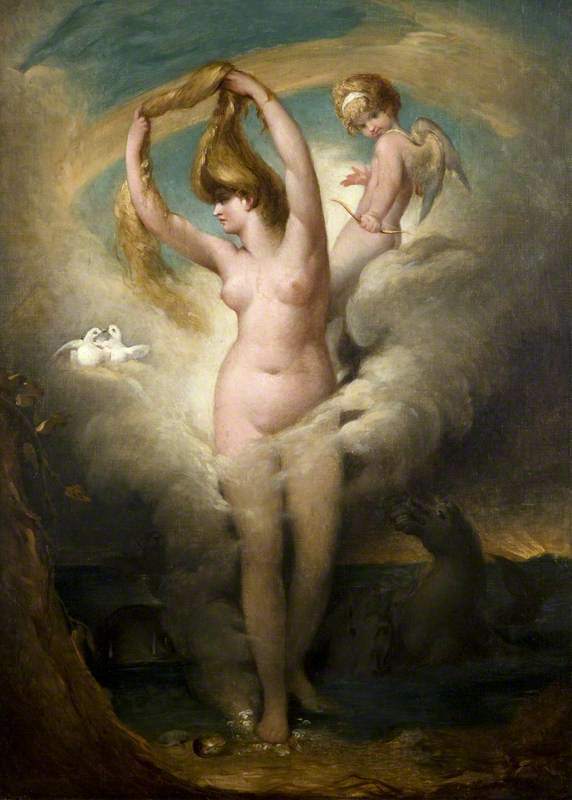 James Barry (1741–1806), Venus Anadyomene (c 1772), oil on canvas, dimensions not known, Ulster Museum, Belfast, Northern Ireland. The Athenaeum. Outside of the Royal Society of Arts (where his original paintings remain, seldom seen), one of Barry’s few surviving accessible works is his Venus Anadyomene (c 1772). This is the same Venus/Aphrodite rising from the sea which had been painted by Apelles and, in about 1486, by Botticelli as The Birth of Venus. John Flaxman (1755–1826) was only slightly older than Blake, and trained in the Royal Academy Schools just before him. Although he was primarily a sculptor, and made his early money from producing grave monuments, he drew quite prolifically, and painted a little too. He was elected a member of the Royal Academy in 1800, and the Academy created the post of Professor of Sculpture for him. He produced several sets of drawings for engraving, and was an important patron to Blake, who engraved a set about Hesiod for him. 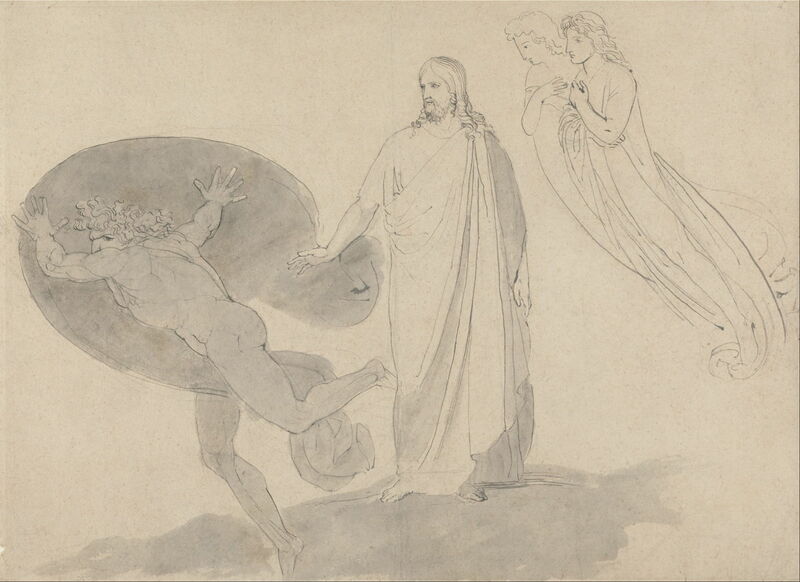 John Flaxman (1755–1826), Get Thee Behind Me, Satan (1783-87), gray ink with graphite and gray wash on moderately thick, slightly textured, cream laid paper, 40.6 x 55.6 cm, Yale Center for British Art, New Haven, CT. Wikimedia Commons. Flaxman’s Get Thee Behind Me, Satan (1783-87) gives an idea of some of his drawings which had common themes and style with Blake’s work. Thomas Stothard (1755-1834) was another contemporary who knew Blake from their time at the Royal Academy Schools, and was effectively a competitor. Stothard’s career advanced more quickly, was much more lucrative, and is now largely forgotten, as are his paintings. He was elected a full member of the Royal Academy in 1794, and later became its librarian. His book illustrations became very popular, and generated him a good income. In total, around three thousand of his illustrations were engraved, and he contributed to alderman John Boydell’s Shakespeare Gallery. Thomas Stothard (1755-1834), Prospero, Miranda and Ariel, from “The Tempest,” Act I, scene ii (c 1799), oil on paper laid on canvas, 21 x 26 cm, Yale Center for British Art, New Haven, CT. Wikimedia Commons. 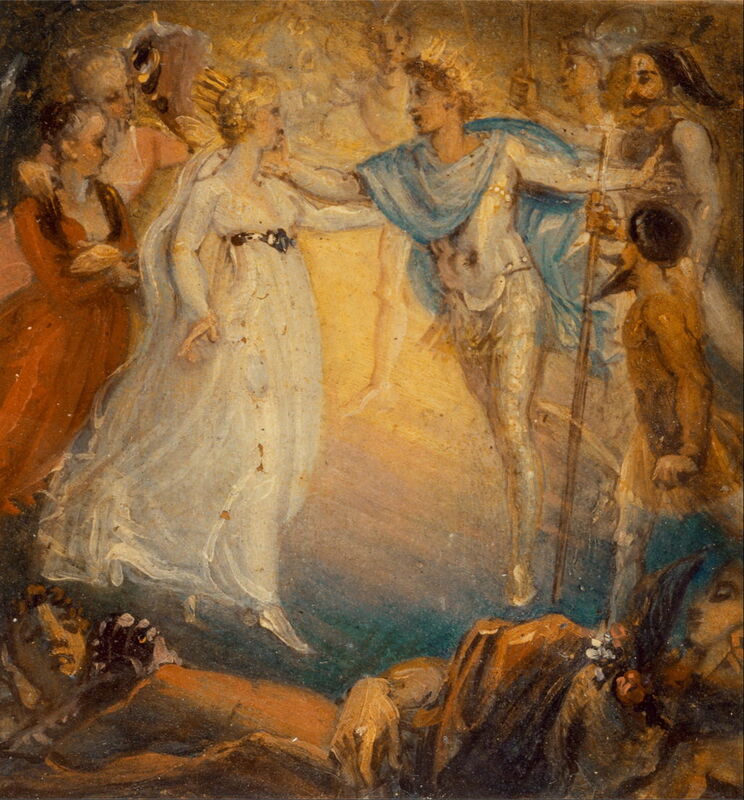 Typical of Stothard’s better Shakespearean paintings are Prospero, Miranda and Ariel, from The Tempest, Act I, scene 2 (c 1799), above, and Oberon and Titania from A Midsummer Night’s Dream, Act IV, Scene 1 (1806), below. Thomas Stothard (1755-1834), Oberon and Titania from “A Midsummer Night’s Dream,” Act IV, Scene i (1806), oil on paper mounted on board, 14.6 x 14 cm, Yale Center for British Art, New Haven, CT. Wikimedia Commons. William Blake painted relatively few scenes from Shakespeare, and was not among those selected by Boydell for his Shakespeare Gallery. But it was Stothard’s The Pilgrimage to Canterbury (1806–7) which caused most friction with William Blake, who seems to have assumed that he would be commissioned to paint this subject. It shows the pilgrims from Chaucer’s Canterbury Tales on their journey. I am afraid that this image appears too high in chroma, and you may find that below is more useful. Thomas Stothard (1755-1834), The Pilgrimage to Canterbury (1806–7), oil on oak, 31.8 x 95.2 cm, The Tate Gallery (Purchased 1884), London. Wikimedia Commons. In 1805, Blake was commissioned by Robert Cromek to produce illustrations for Robert Blair’s poem The Grave. Blake seems then to have proposed the idea of his painting Chaucer’s Canterbury pilgrims for Cromek, but Cromek commissioned Stothard to undertake the work shown above. Blake pressed on and completed his painting without a commission, sadly using glue tempera which has not survived the years well. Stothard also produced a later, similar treatment of Shakespearean Characters (1813), below, which is a summary of many of his individual Shakespearean scenes. The figures and scenes shown include (from the left) Twelfth Night (Olivia, Malvolio, Sir Toby Belch and Sir Andrew Aguecheek), The Merry Wives of Windsor (Falstaff and friends), As You Like It (Celia and Rosalind), The Tempest (Prospero and Miranda), King Lear (Lear and Cordelia), Hamlet (Ophelia and Hamlet), and Macbeth (Macbeth and the witches). The other two painters who were important to William Blake were John Linnell (1792-1882) and Samuel Palmer (1805-1881). Both became friends with Blake during his later years, and Linnell gave him substantial financial support, encouragement, and supported his widow. They both deserve separate articles in the near future. Posted in General, Painting and tagged Barry, Blake, Flaxman, Linnell, Mortimer, narrative, painting, Palmer, Shakespeare, Stothard. Bookmark the permalink.